2010 Ocean Art winner, Matthew Tworkowski, shares his underwater photos and his wonderful experience aboard the Arenui in Indonesia. 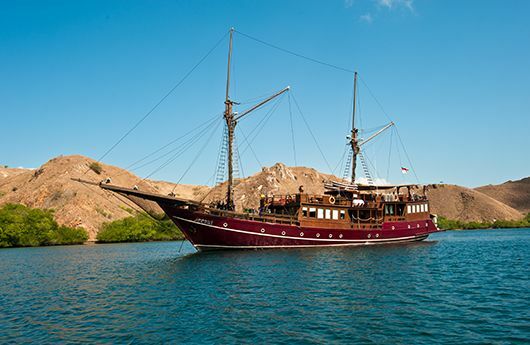 The Arenui Liveaboard is a traditional Phinisi, a classic Indonesian wooden sailing vessel which raised its anchors in June 2009 and began its exploration of the Indonesian archipelago. On this particular route, “Grand Komodo,” we set sail from Bali, exploring the underwater wonders of Islands such as Lawuan, Sumbawa and Bima before reaching the halfway point. 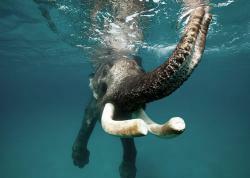 The halfway point included a visit to Komodo Marine Park and traversing back to Bali. Along the way we stopped to dive Sangeang Volcano, Sotonda, and the Moyo islands. For the underwater photographers there were two Macs with large screens, Adobe Photoshop CS5, card readers and the most meticulous care your camera housing will ever receive, never once was my housing in a rinse bath with another housing and they are blow dried with a special connection on a dive tank so you can remove those memory cards with the utmost confidence that no drops of water will enter your housing when opened. On each dive housings had their own container on the way to and from dive sites and the crew very conscientious as to whose gear was whose, and particular needs of individuals. 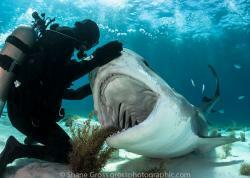 My underwater housing and camera are like children to me and I had the utmost confidence that they would be treated equal to or better than I could offer by the crew. As for the wide-angle diving I would rate it good to very good with a couple of exceptional fishy dives at Castle Rock which had everyone at a loss for words. 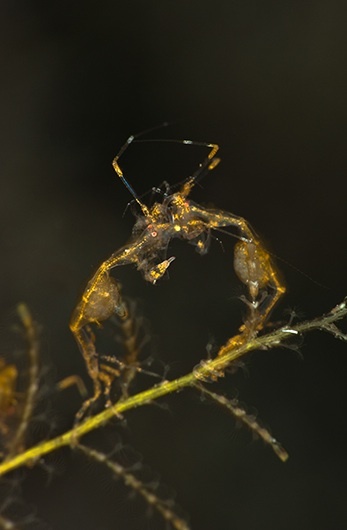 The macro diving was world class, which came as a surprise to me as I have visited Komodo area before and never realized how many rare and unique critters could be found on some of the muck dives on the journey. 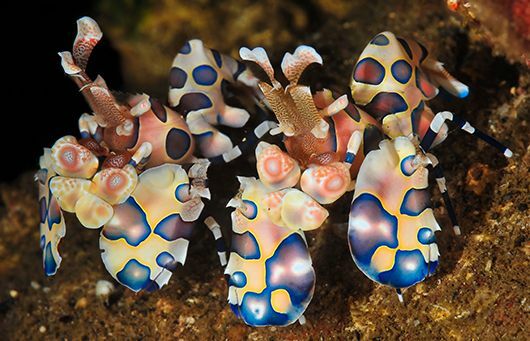 As one of the guests remarked, “right up there with Lembeh.” It’s a real testament to the guides who has an intricate knowledge of the critters and where they would be found. All my images were taken with a Nikon D700, Nexus Housing, Inon Z 240 strobes and SubSee diopters (for macro). The lenses I used were a Nikon 105mm VR for macro work and a Nikon 16-35mm for wide-angle. “Briefing, briefing,” a catch cry we were all to become familiar with over the ensuing 11 days as Jerry rounded everyone up for a dive brief sharing his intricate knowledge of the dive sites and to all the underwater critters we were likely to see. Detailed maps displayed on two large LCD monitors gave everyone an idea of the structure and depths of all the dive sites. I chose to hire my gear given the airlines exorbitant excess luggage fees which were exceeded by my camera and housing equipment alone, happily they had 5mm wetsuits available as well as 15L (~80cf) tanks for those in the high air consumption category and Nitrox fills. Two dives were at Lawuan Reef, fairly shallow relaxed dives, which gave everyone the opportunity to wet their gills and get them shutters clicking over with some very nice Nudibranch species. 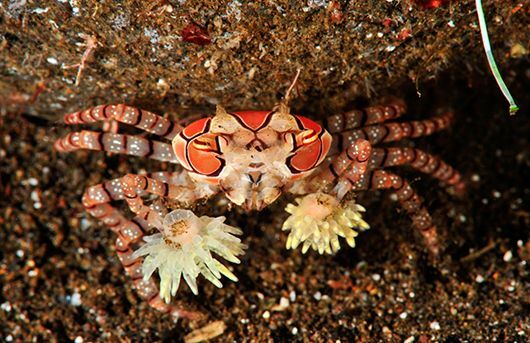 We also saw a Hairy Octopus, Cuttlefish, and Candy Crabs as well as several different spider crabs. Day 2 consisted of 3 day dives and a night dive around the islands of Bima and Sumbawa and would be regarded as A+ muck dives. 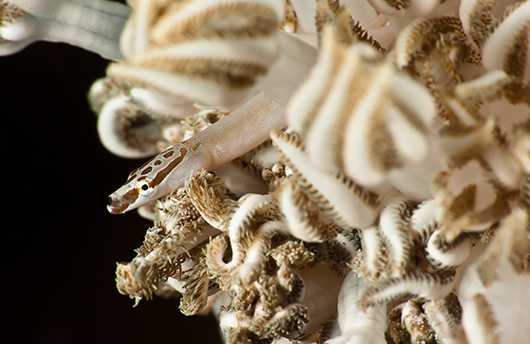 We started at a dive site called Tanjung Sai which harbored critters such as Pipehorses, Pipefish, Ghostpipefish, Nudis, Skeleton Shrimp (several with offspring) Juvenile Waspfish, and Cowries to name a few. 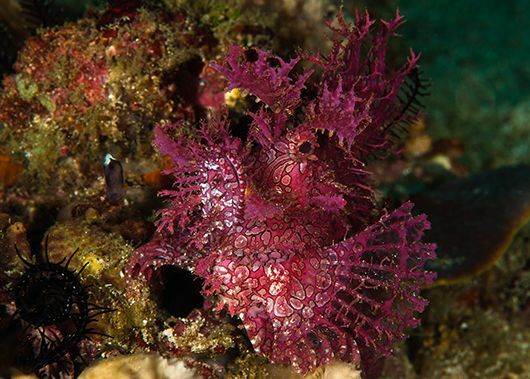 The next 3 dives were at Unusual Suspects with critters such as Banded Boxer Shrimp, Blue-Ringed Octopus, Harlequin Shrimp, Peacock Mantis Shrimp, Colemans Shrimp, Tiger Shrimp, loads of Nudis, Ghostpipefish, Thorny Seahorses, several Frogfish, cuttlefish, and cowries. The list was endless. Day 3 and we had arrived at the famous Komodo Marine Park where we were to spend the next 5 days diving around Komodo and Rinca islands. The first 2 dives were at Castle and Crystal rock large pinnacles rising up from the depths with clear water. There was more current but loads of wide-angle opportunities. We witnessed a small reef shark gathering for about 15 minutes before drifting around the backside of the pinnacle to explore. Hawksbill turtles seemed fairly abundant as well as large schools of Jacks, Fusiliers, Large Cod, the occasional Napoleon Wrasse, White tip Reefies being cleaned, Schools of Batfish, Harlequin Sweetlips, Dogtooth Tuna,Titan Triggerfish, Humphead Wrasse, Moorish Idols and an amazingly diverse selection of hard and soft coral. Dive 3 and 4 were at sites called Tawawa Besar and Wai Nilo(night) where we found so many Nudis I actually didn't have time to shoot them all. 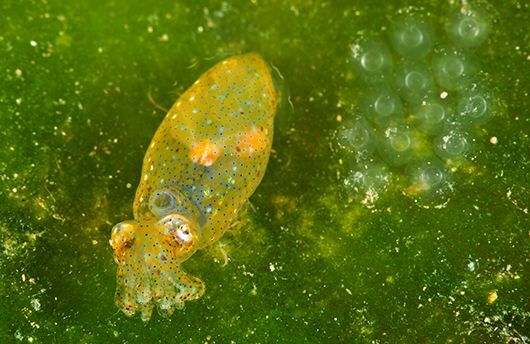 Cuttles, more Frogfish, Decorator Crabs, Orangutan Crabs, Porcelain Crabs, Bobtail Squid, and Spearing Mantis Shrimp rounded out the critter sightings. Komodo Dragon on Rinca Island. 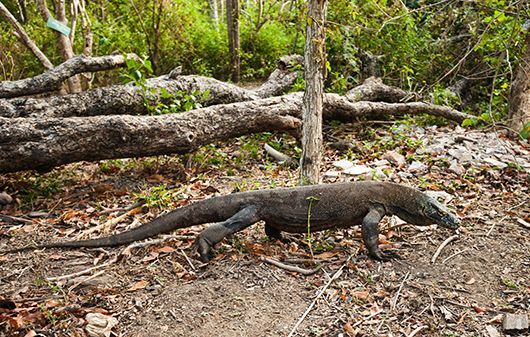 Day 4 consisted of a walk on Rinca Island to see one of Mother Nature's wonders in the Komodo Dragon. After a short briefing from a small man with a big stick, we set about on a walker's trail witnessing several Dragons including a female which was nesting. Back at the ranger station we were surrounded by several Komodo Dragons, although being quite early in the morning they were more intent on warming their blood than seeking out food. The two dives for the afternoon/night were Torpedo Alley, and the famous Cannibal Rock; regarded by many as one of the world's top 10 reef dives. Cannibal Rock is a pinnacle coming up to within 3 meters of the surface and was named by European explorers when they climbed one of the surrounding hills and witnessed a Komodo Dragon feasting on another Komodo Dragon. Cannibal Rock is rugged, untamed, and beautiful and provided two Rhinopias, a Weedy and Paddleflap, as well as Pygmy Seahorses, Large Green Turtles, two beautiful Yellow Ridged Ceratosoma (my new favorite Nudi), a very pregnant Giant Frogfish, Candy Crabs, Octopus, loads of different Nudis, as well as a very healthy population of fish species. 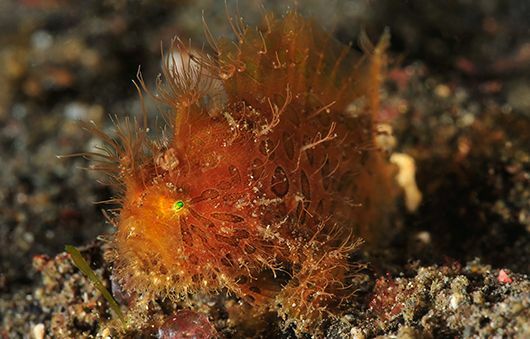 Torpedo Alley was a night dive and subjects that stand out in my mind were a tiny Hairy Frogfish, boxfish, Bobtail Squid, Stargazers and many Skeleton Shrimp which brought me much amusement watching their complex behavior. 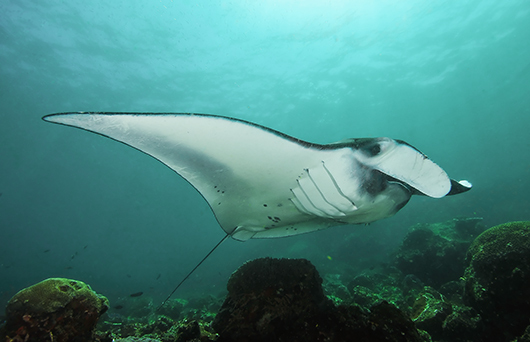 Manta Alley is located in Tora Langkoi Bay along the south coast of Komodo. It is in fact a rock islet forming part of a chain that barely pierces the ocean’s surface. As can be guessed from its name, many manta rays are known to frequent this site and it is the most popular one in Komodo for spotting them. Castle Rock is another submerged mound situated a kilometer further north from Crystal Rock. 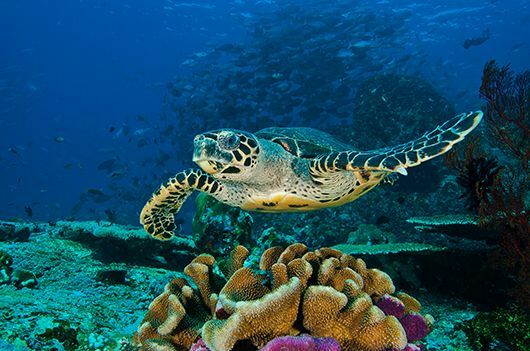 Its exposed location means strong currents but experienced divers will love the thrills to be had on this dive. In fact, the main action comes from watching the staggering amount of fish such as groupers, midnight snappers and impressive schools whipping past. Back to black sand and small critters in the shadow of Sangeang Volcano for 3 dives at Hot Rocks and Lighthouse. Hot Rocks was a truly unique experience with heated water and bubbles rising up through the water column, which kind of reminded me of what it would be like in a fish tank. Lots of Nudis, Leaf Scorpionfish, Pygmy Seahorse, Commensal Shrimp, Xeno Crabs, and Zanzibar Shrimp. Lighthouse was a fantastic muck dive where we saw Ornate and Robust Ghostpipefish (juveniles and carrying eggs), Boxer Crabs, Warty Frogfish, Painted Frogfish, some very rare Nudis, Grass Squid with eggs, Crinoid shrimp, Waspfish, Ambon Scorpionfish, Spotfin Frogfish, Spiny Devilfish, White V octopus, and a Pipefish species that is so rare (Spotted Xenia-Pipefish, Siokunichthys herrei) that apparently I am only the second ever underwater photographer to have pictures of it in the wild (my favorite days diving)! The one huge bonus which I haven't mentioned yet was the privilege of meeting and diving with the amazing underwater photographer William Tan and his dive guide, Noldy. William was very generous with his time and knowledge, and I learned more in 11 days than I have in 5 years of taking pictures. My first impression of the Arenui was what a beautiful and well maintained vessel she was as we made our way across to her in small boats. Jerry, Debby (our hosts and divemasters), and crew were quick to greet us with warm friendly smiles and a nice cool drink before giving us all a run down on the boat and showing us to our rooms. All rooms had their own bathroom as well as a desk for computers and chargers as well as ample storage space for 2 people. The food was "to die for" with 5 courses a day starting with a light breakfast before the morning dive, then a big breakfast which you pretty much ordered anything you liked. Lunch following closely after dive 2. Dive 3 ended with fruit and snacks and usually after the night dive. Dinner rounded off the day. I was surprised to find options for dinner which included 2 choices for entree and main as well as dessert. Vegetarian options were also available. The last evening we enjoyed a sing along with the crew after an amazing dinner which capped of the best diving experience of have had to date. With 22 crew to 12 guests we were pampered beyond belief, The Arenui truly lived up to it’s claim as “The Boutique Liveaboard." I honestly had high expectations of the Arenui, and rate it 10/10. 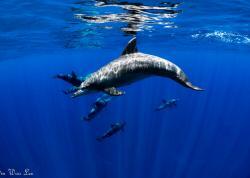 Matthew placed 1st in the 2010 Ocean Art Photo Contest in the Marine Behavior category, and 3rd in Compact Wide-Angle. To see more of Matthew's fantastic images, please visit his online gallery at http://www.redbubble.com/people/matttworkowski.